Certech is leader in production, installation and service of systems and useful components for ceramics manufacturing. 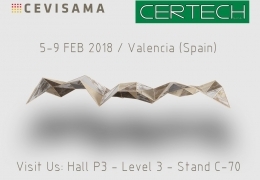 Certech Spa has aimed to develop the ceramics industry worldwide creating cutting-edge and efficient systems and advanced high-performance materials. Download and check out our catalogues dedicated to machines and accessories production for ceramics industry.